CHEONGWON---(Korea Newswire) February 28, 2014 -- Korea Human Resource Development Institute for Health and Welfare, KOHI (President; Ryu Hoyoung) successfully concluded the <Dr LEE Jong-wook Fellowship> Program(24th to 27th February, 2014) with the cooperation of Korea Foundation of International Health, KOFIH. 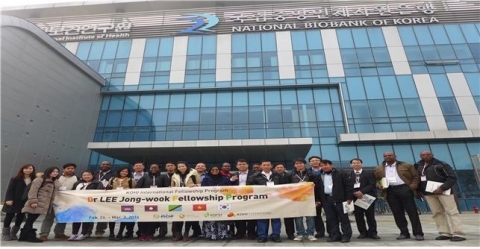 The 21 participants are doctors, nurses and researchers who came from 4 countries(Cambodia, Laos, Tanzania, and Vietnam), and are to stay in Korea for half a year to one year. This KOHI‘s course was designed to give the participants general informations before they start individual clinical trainings. Professors from Kongju National University and the graduate school of public health, Seoul National University gave them lectures. The participants also had chances to visit KCDC(Korea Centers for Disease Control & Prevention), Korean Research Institute of Tuberculosis, Sejong special city’s Public health center and the Central Government Complex of Sejong. After this program, all the participants will be separated into 4 organizations( including Inha University Hospital, JW LEE Centre for Global Medicine of Seoul National University R&DB Foundation, Severance Hospital and Soon Chun Hyang University Medical Center),and continue their hands-on training. KOHI runs various International fellowship programs( i.g. Maternal and Child Health Promotion, Health Policy and Program Management, and Community Health Development) for developing countries and endeavor international cooperations with foreign countries and global foundations for the improvement of world-health.